CB Virgen de la Concha Innova Chef (EBA) tabbed 23-year old American (has also Nigerian passport) guard Rob Ukawuba (190-95kg-94, college: NJIT). He is the second foreign player in the roster as British Antonio Deogratias signed here earlier. Ukawuba played in the summer at Reach 1 Teach 1 (The Basketball Tournament) in the U.S.
Part of last season he spent at Panteras (LNBP) in league where in two games he averaged just 2.0ppg and 1.0rpg. Ukawuba also spent pre-season at Windsor Express in Canadian NBL Canada. Last year he was drafted by Windsor Express (NBL Canada) in second round (16th overall). 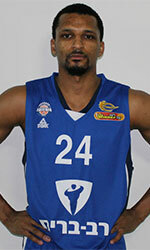 The former New Jersey Institute of Technology staris in his second season in pro basketball. Ukawuba's team was regular season runner-up in A-Sun in 2016.